Historically, Stratford was a buzzing cultural hub, with institutions like The Two Puddings pub drawing prominent actors, musicians, writers, World Cup-winning footballers, boxers and notorious gangsters from all over London to its renowned music nights. Like other parts of the East End, from the swinging sixties to the start of the new millennium, it was a centre for fashion, art and socialising. But the closure of the London Docks and significant deindustrialisation saw a decline for the surrounding area. 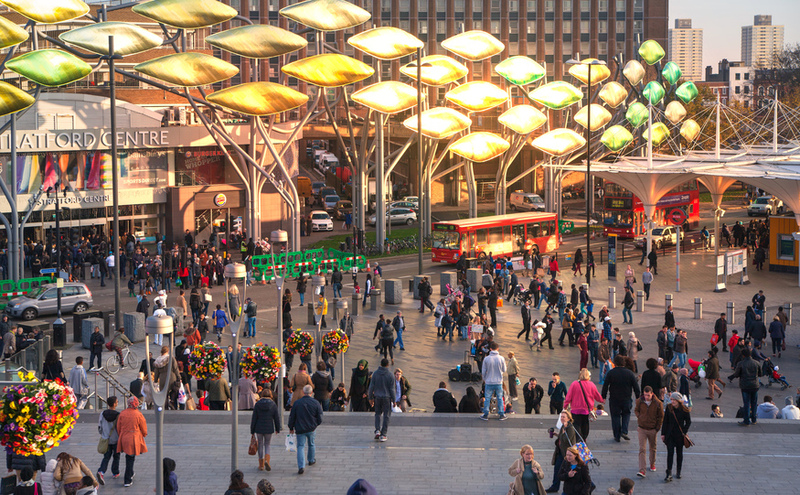 Much has happened in Stratford over the past decade though — from hosting the London 2012 Games and West Ham Football Club’s move from Upton Park — to Westfield Stratford City bringing in a host of restaurants and shops. Now, there is plenty to do, see and eat, from all the major chains to small independents that make Stratford a thriving foodie destination. Speaking of Westfield, let's get it out of the way early on in this guide. There are more than 90 traders — restaurants, fast food and cafés are all represented — with most major chains having at least one outpost. Cuisines from around the world are available at the food courts, The Street and the Great Eastern Market; it'd take weeks to try everything. Yet Stratford boasts plenty of smaller operators too, which is what this article is focusing on. Three-time Time Out Loves award-winner, The Sawmill, is a whimsically decorated café, all bricks and fairy lights, which keeps people coming back with a rotation of home-cooked specials and delectable cakes. The fresh juices, like strawberry and lime, and dishes of eggs with wild mushrooms and avocado, and veggie lasagne are particularly tasty. In the Stratford Centre — the smaller shopping arcade opposite the train station and Westfield — Granier serves freshly baked breads and sandwiches. Centre Café is a typical greasy-spoon with full English breakfasts and retro favourites like chicken kiev on the menu, while Patisserie and Cakes, a stall in the indoor market, is worth visiting for sweet treats, scones and cheese straws. In East Village, sits Hand Café which serves wonderful Greek-influenced brunches and Square Mile coffee. Nearby, Ginger and Mint has a wide selection of smoothies, salads and wraps, while Signorelli serves a tempting array of artisan baked goods and breads. Gluten, sugar and dairy free options are available. Market Village has a host of options for a quick and yet fulfilling lunch. Health Kitchen occupies a tiny storefront in the maze of shops connecting the Stratford Centre to Stratford Broadway. 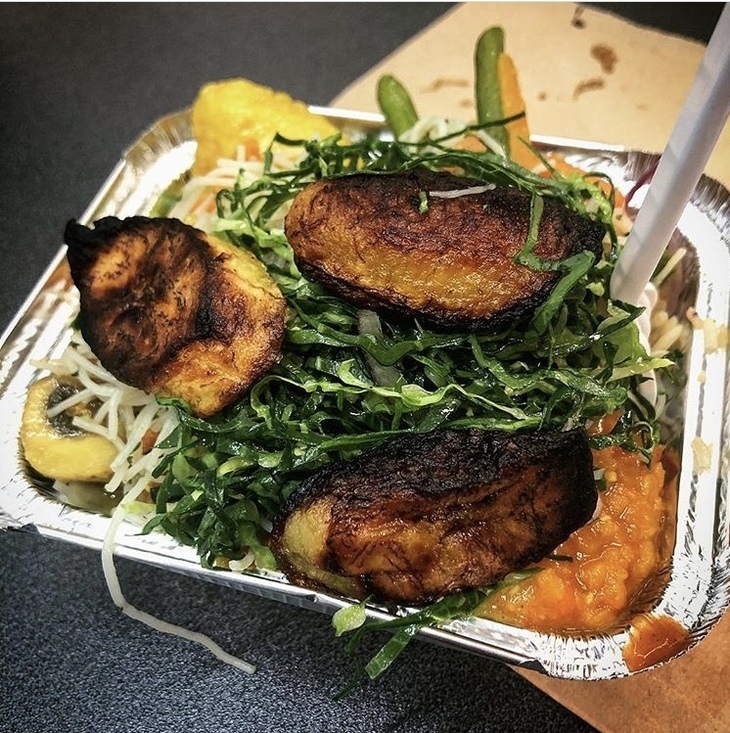 Opening hours are inconsistent but if you can catch it, less than £5 will buy you a meal box of at least six vegan, baked (not fried) dishes such as mac and cheese, vegetable curry and delicious noodle salads. Mr Ribs Café is a butcher and restaurant which is also worth a visit; it serves traditional Brazilian fare such as feijoada, a black bean and meat stew. Inside the Stratford Centre itself, Lituanica, the Lithuanian grocery shop has a plentifully stocked deli with lots of cold cuts and ready-made hot dishes to take away. Along Stratford Broadway, a number of market stalls serve quick grab and go meals. Tradition by Alex and Daily Fresh are two of the best. The former is a small Romanian marquee that draws in hungry crowds with the aroma of grilling kebabs and classic regional dishes. It has no discernible online presence or location finder but it is there, every day from roughly 10am-6pm. 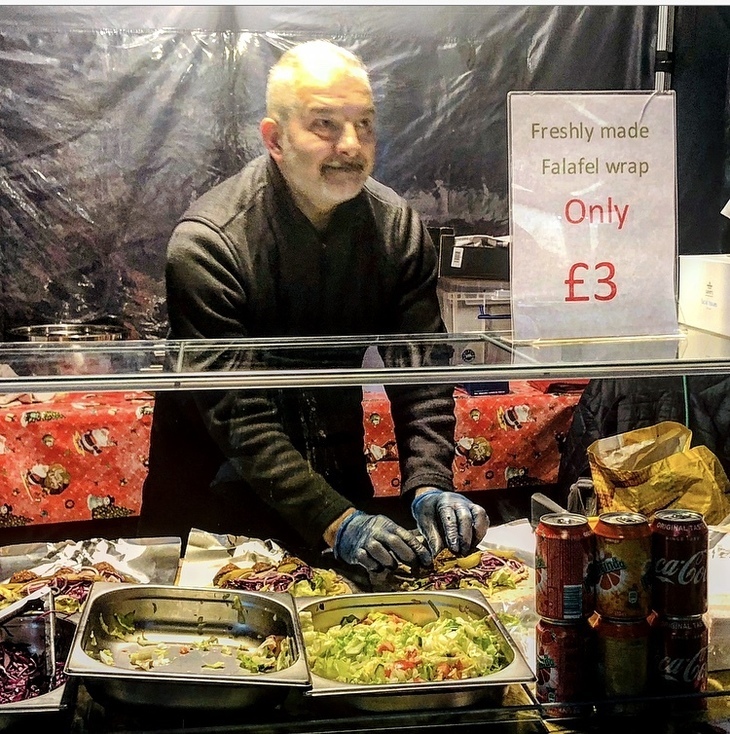 Daily Fresh serves falafel wraps, lovingly stuffed with the full works for £3. 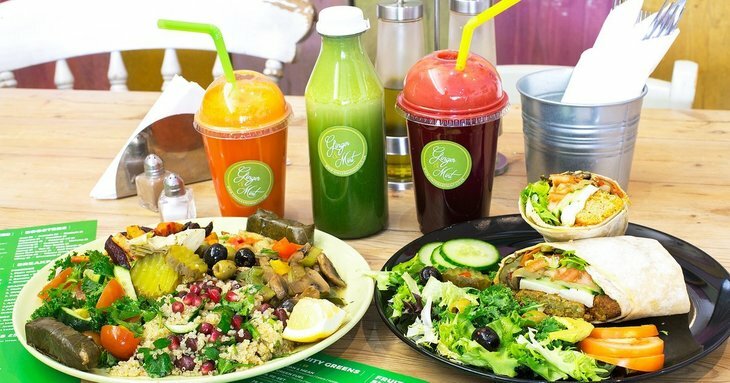 Olive and Lemon is a little café offering fresh, Mediterranean inspired cuisine such as kuzu kavurma, a Turkish lamb casserole and mixed grills. The East Village branch of ethical seafood restaurant, Fish House, has a dedicated lunch menu with dishes like moules mariniéres and fish and chips — including cod, haddock and skate. As well as the usual big-boy coffee chains, there are many places to curl up with a mug and watch the East End go by. 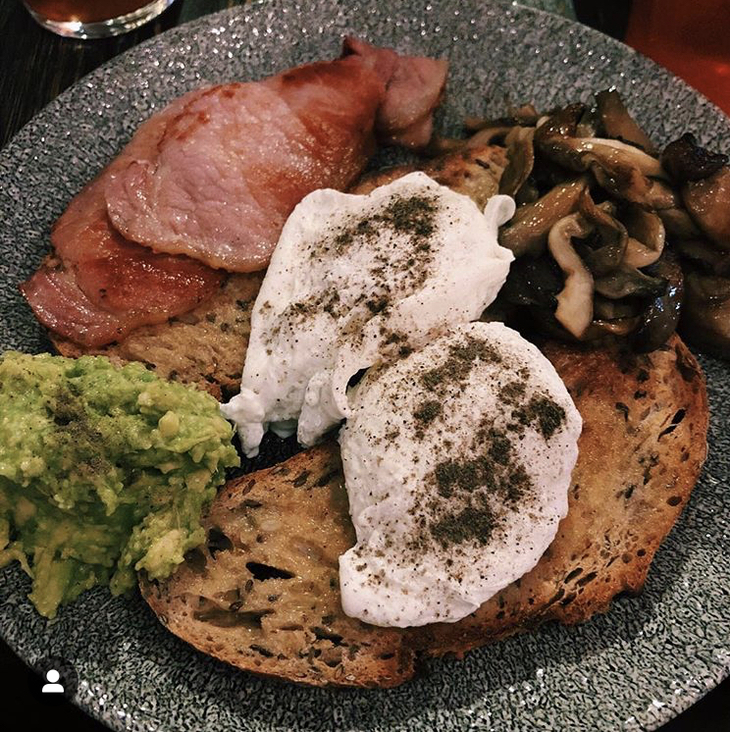 East Village’s Tina We Salute You, just like its Dalston sibling, puts coffee at the forefront of an exciting menu which also features bagels, pancakes and sourdough. Rotating artwork on the walls is always interesting. The Last Drop, next to the ArcelorMittal Orbit in Queen Elizabeth Olympic Park, is a serene riverside option for a light snack. 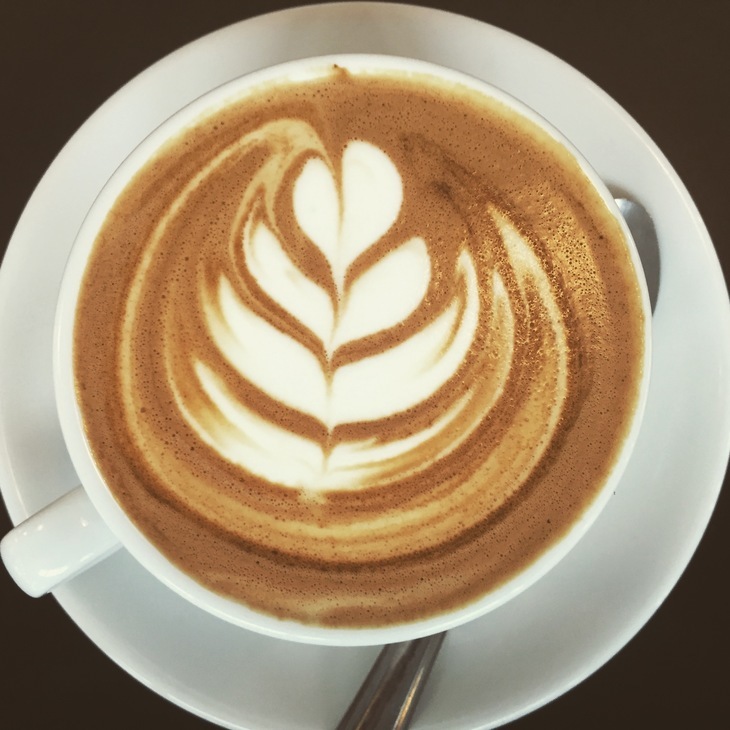 Café Mondo in Stratford Library, from the same team as 1966 fish and chip institution I Fratelli nearby, has offered a wide selection of Italian sandwiches to sink into alongside a caffeine kick, since 1997. While newcomer, Unit Six, in the Stratford Centre, is the latest in a growing list of trendy little spots in the area. East Village has its fair share of sleek, fashionable restaurants like Darkhorse and Village Vanguard, which both offer modern fusion British food. A stone’s throw away, Firezza and Santi embrace Italian cuisine with Neapolitan pizzas and fresh pasta dishes. On the other side of Stratford, MexiCasa is a great little eatery for authentic Mexican flavours and Tex-Mex cuisine. 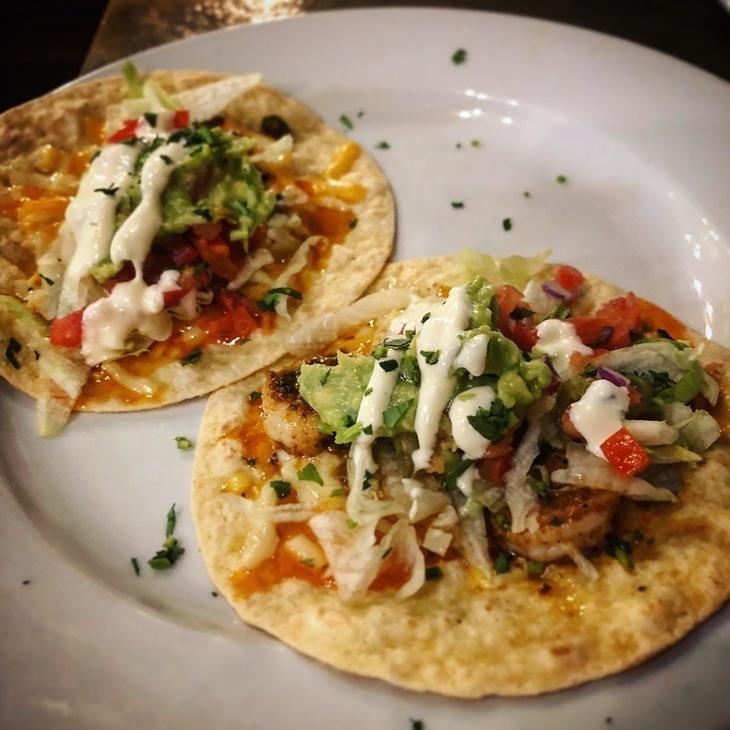 Worth visiting for the jumbo margaritas and vivid interior alone, the food is zesty and fresh — nicely charred shrimp tacos are a particular highlight. Further down the road, amidst towering skyscrapers sits an East End café which has been churning out Thai dishes since 1984. The Pie Crust is a local favourite, tiny and cosy with a generous £2.50 corkage deal, its unique character makes it one of Stratford’s most memorable restaurants. Another place which serves a mixture of café food, pies and Thai cuisine, is Thai Pie, by Maryland Station. The curries are the standout item here, with good depth of flavour and thrumming with spice. 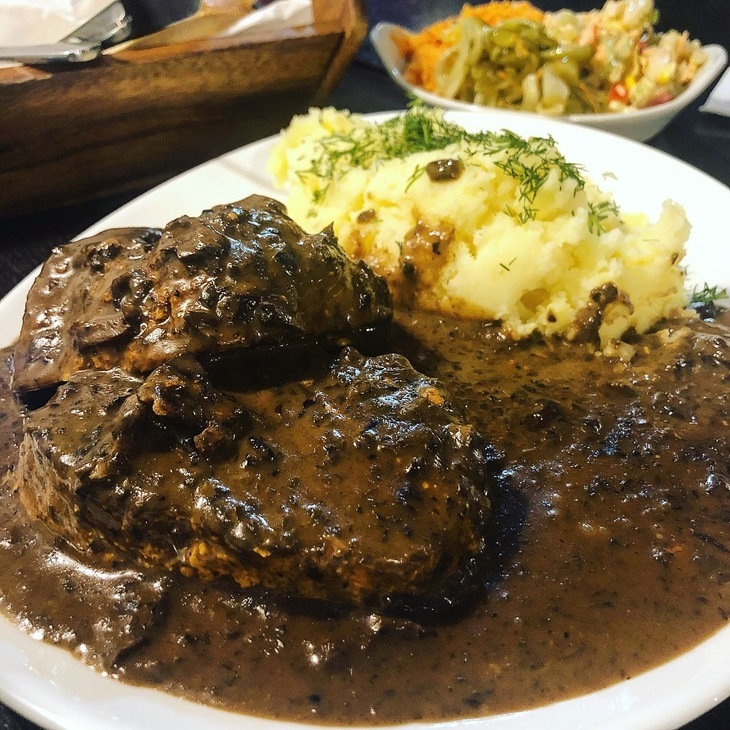 For authentic Polish food with big flavours and even bigger portions, head to Londek Café. A wall-sized blackboard clearly states the dishes of the day in Polish and English. The popular hunter’s stew, bigós and meat-stuffed pierogi, with lashings of sour cream, are serious winter warmers. There is no shortage of watering holes in Stratford, from craft beer specialists to old East End pubs – the area has it all. Some places, however, offer something a little bit more interesting. For games and activities, Loading Bar's Stratford venue, Secret Weapon, is the place to go. More than 100 board and card games, computers, PlayStation 4 and Xbox consoles mean plenty of fun to be had discovering new ways of beating your friends, while sipping on game-themed cocktails (if you're stuck, go for the Skyrum). Neighbourhood in East Village is noteworthy for its rotating range of cask ales, lagers on tap and collection of craft beer. 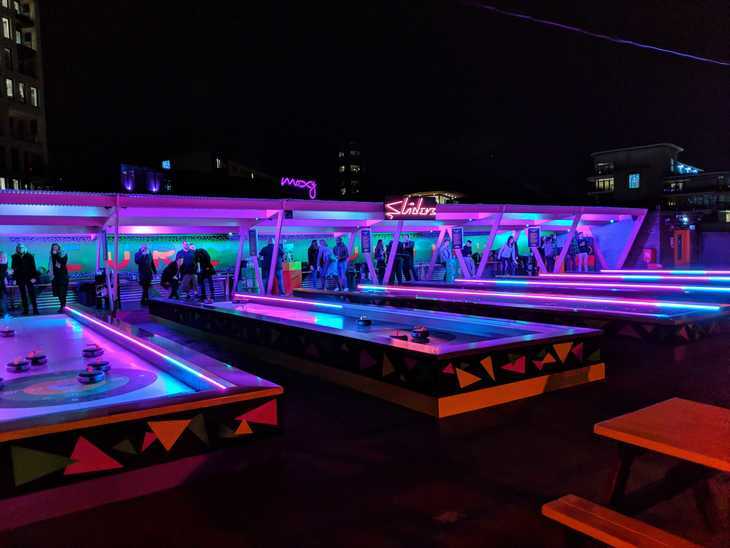 From the spring months through to late November Roof East — sprawled across the Stratford Centre car park — is kept lively with open air cinema nights, barbecues and games. 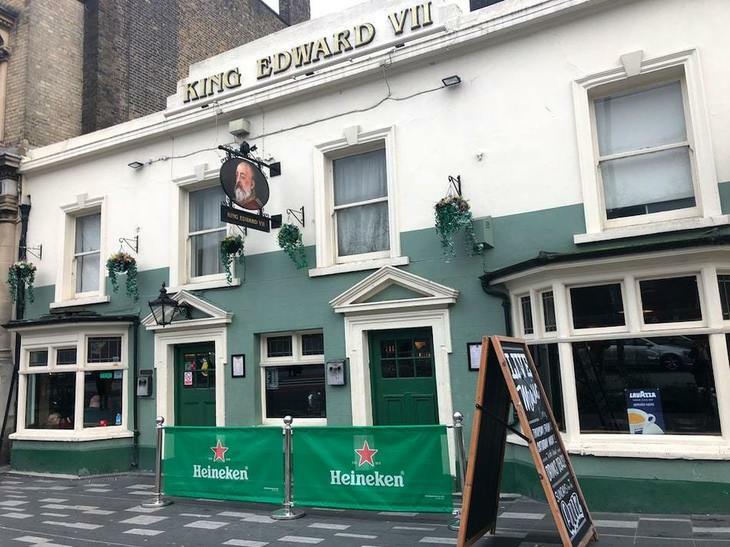 King Edward VII, affectionately known as “King Eddie’s” is one of the oldest pubs in the area, dating back to the 18th century. The pub, with its original pedimented doors and early 19th century windows, was once called The King of Prussia, but this was changed to a more patriotic name after King Edward VII’s death in 1910. It hosts quiz nights, live music and Sunday roasts as well as Prosecco Thursdays, making it a popular venue with the after-work crowd. Further along the road, is another slice of history. The Olde Black Bull dates back to 1829. A collection of large screens and a quaint beer garden make it a good place to watch sport or have a pre-match pint if West Ham are playing at home. Close by is The Queen's Head, which, with its regular live Irish music and late-night license made it a regular haunt for many locals. Now, a change in management has signalled an end to the bands but it is still well-liked for bargain booze and games of pool. Another late-night establishment, the O12 Bar and Grill is worth a mention, if not only for the Nepalese and Lithuanian bar snacks on the menu. As well as a selection of south Asian staples, a daily Nepalese special, momos and dry meat fries sit alongside kepta duona (a type of fried bread) and other Lithuanian nibbles in an uplifting affirmation of the diverse food this blossoming area has to offer. Note: The catchment of Stratford is huge, taking in parts of Hackney Wick and Leyton. These areas also provide rich pickings, deserving of their own guides. So, for the purposes of this article, we have drawn the parameters as Maryland Station towards the east, the River Lea in the Olympic Park in the west, Pudding Mill Lane Station in the south and Abercrombie Road in the north.